In this video, Dr. Huntoon discusses the Hiatal Hernia, an often overlooked condition that your medical doctor will rarely consider. If you have indigestion, reflux, GERD, have gall bladder concerns, listen to the radio show and then come in and have yours fixed. An evaluation to restore your health and sanity is warranted. Dr. Huntoon will usually treat the problem on your initial visit. Hiatal Hernia... More Common Than You Think! I have decided to write about this aspect of human health, because like the title says, It is More Common Then You Think. Also of importance is being able to appreciate how one can develop such a condition, and how it may be confused with other conditions that will lead your Health Care Practitioner on a wild goose chase. Likewise, it will leave the person with the condition not knowing what to do. A Hiatal Hernia is a disorder of the Gastro-Esophageal Junction that results in a sac-like dilatation of the Stomach protruding above the Diaphragm. As a result of a portion of the Stomach being above the Diaphragm, one could suffer from retrosternal pain (heartburn) and sometimes regurgitation of gastric juices into the mouth. These manifestations are attributed to incompetence of the esophagastric sphincter (lower esophageal sphincter) and are accentuated by positions favoring reflux, e.g., bending forward or lying on your back. It should be noted that gastro-esophageal reflux disease (GERD) can occur without a Hiatal Hernia; conversely, a Hiatal Hernia can be present without these reflux symptoms. Unfortunately, seeing exactly where the stomach is located from inside the stomach (unless the stomach has windows), will not tell you where the stomach is related to the diaphragm. It may in fact, result in creating a Hiatal Hernia when they remove the endoscope, as pulling it out may pull the stomach up through the diaphragm ever so slightly and create the weakening of the Lower Espophageal Sphincter. This is vital to understand, as most Medical Doctors NEVER consider this when performing the test. 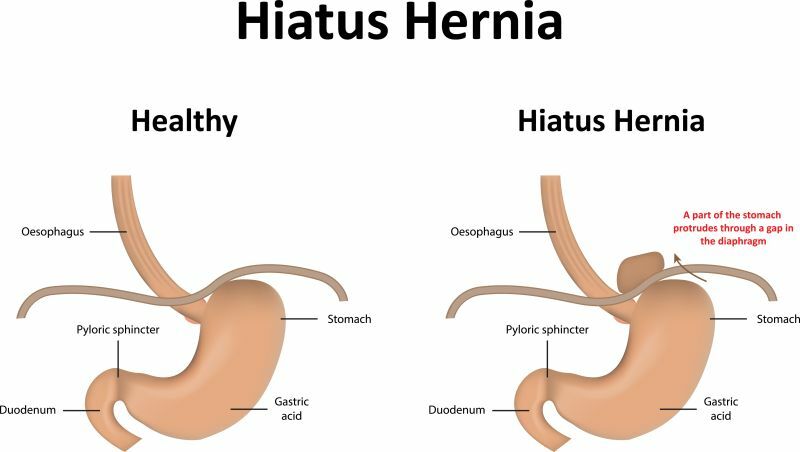 Most cases of Hiatal Hernias don’t require medical treatment. The presence of symptoms usually determines treatment. If you have acid reflux and heartburn, you may be treated with medications or, if those don’t work, surgery. To perform surgery, doctors either make a standard incision in the chest or abdomen, or use laparoscopic surgery which shortens recovery time. There are also certain foods that may increase your risk of Heartburn. Now that I've covered the formal technical information above, as given by Robbins: Pathologic Basis For Disease, I'd like to expand upon that information and help you apply it to you personally. After all, what's the point of having information if you don't know how to apply it to yourself? Tied into the diaphragm at its point of attachment to the body wall are two very important muscles called the Psoas muscles. These two muscles are controlled by the Kidneys. The relationship will become importantly clear in a minute. If one is dehydrated and is breathing incorrectly, it will cause the psoas muscles to conserve on their resources which will contract and shorten them. This will create Low Back Pain and, likewise cause the diaphragm to contract and weaken. As a result, the diaphragm will begin to pull apart at the area where it attaches to the gastro-esophogeal junction, creating the widening in the hiatus (the opening where the esophagus passes through). This sets up the body for the Hiatal Hernia. Therefore, it is important to stay well hydrated and keep the Kidneys functioning properly. For more information on this topic, please click on the link for Kidney Health and what you need to know. improper Chest Breathing instead of Abdominal Breathing, among others. If you experience any of these symptoms regularly or periodically, you should consider having your gallbladder evaluated. Your esophagus is the tube that connects your mouth to your Stomach. As it passes through the opening or hiatus within the diaphragm, it then opens into the stomach. The Lower Esophogeal Sphincter (LES) is a muscular ring that separates the Esophagus from the Stomach, and is also where the Diaphragm attaches separating the Thoracic Cavity, where your Heart and Lungs are, from the Abdominal Cavity, where all of your digestive organs live. The Diaphragm is the muscular wall that expands down upon inspiration, pushing your abdomen outward, and contracts back upon expiration, allowing your abdomen to be pulled back in where it began. NOTE: This is important to appreciate, because if you don't breathe through your abdomen, you are creating the basis for a Hiatal Hernia. Abdominal breathing is the correct way to breathe. Most people I have worked with are "Chest Breathers." Try to notice which part of your body moves when you breathe in and breathe out. It should be your belly moving out with inspiration, as the Lungs fill downward with air pushing the abdomen out, and the belly moving back in after expiration. Work on perfecting this and your health and digestion will improve tremendously, simply by doing this and nothing else. I have had several patients over the years who have presented with chest tightness that began as indigestion, left shoulder and upper arm pain, and have just come from the hospital or Medical Doctors Office having had a Cardiac work-up including a Cat Scan, an EKG and Stress Test, with all reports being normal. The costs of such a work-up is in excess of $60,000.00, with the outcome being, "You did not have a heart attack (Good News!) and you can go home, but you should follow up with your Physician if it persists." Then their doctors have told them to take anti-anxiety medications and try to relax, as the tests don't indicate any Heart problems. This is great that the Heart isn't a problem, but it doesn't address their concern. And it shouldn't require all the tests and work-up costs to determine the person isn't having a heart attack. One simple blood test is all that is needed to check for cardiac enzymes and it shouldn't cost in excess of sixty grand. When they finally decide to call me, the answer is always the same. The problem has consistently shown up as a Hiatal Hernia. The best part about that is the condition can be resolved in 4 or 5 deep breaths while I apply pressure at the base of the sternum to the Stomach and traction toward the feet to reduce the Hiatal Hernia. The patient reports immediate relief of all their symptoms, and they begin to breathe normally and go back to a normal life. This is such a great feeling to have when helping someone who suffers with this concern, knowing it can be fully handled in about 30 to 45 seconds. To learn the true reason for why you get GERD, Reflux, acid indigestion and ultimately a Hiatal Hernia, click on the link. If you suspect you may have a Hiatal Hernia, or if you have difficulty taking a deep breath, indigestion or reflux, call the Office and tell us you'd like to have the Hiatal Hernia Check. The check itself takes three seconds, and the solution takes 30 to 45 seconds. I will follow the correction with helping you to identify why you developed this condition, and instruct you on how to restore balance to your systems. So call the Office at 845-561-BACK (2225) and let us know you want the Hiatal Hernia Check.